Their meatballs and mashed potatoes (you can have fries instead of mashed potatoes) with a knob of their cranberry sauce – ah – it sure hit the spot! I wanted to get a mortar and pestle that was advertised in the paper, and I decided why not invite my brother for Swedish meatballs? We got there at 1:45 pm and we deliberately timed it so we wouldn’t run into long lines. Guess what? I still had to wait in line for half an hour. Looks like the word’s out that IKEA’s chefs know a thing or two about simple but good food. I get this feeling that half of Montreal’s population goes to eat at IKEA. I believe there’s another IKEA in the south shore. On our way out, I decided to have a look-see in their food store and was tempted to pick up a book of Swedish recipes, but I had to resist. You know what happens. You keep collecting recipes but get to try only a third of your collection. 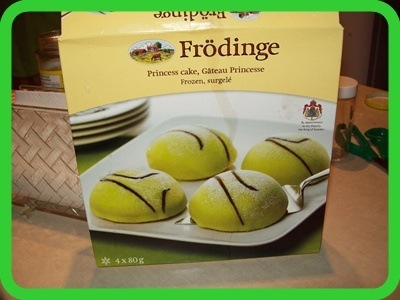 So I opted instead for a bottle of Swedish sparkling gooseberry drink and a box of princess cakes – Frodinge in Swedish. Imagine fussing over appetizers, cocktails, the main meal and home baked bread and then you realize you hardly have any time left to whip up dessert. I’ve got a simple solution for you. Run to your nearest IKEA and head straightaway for their food department (where they also sell hotdogs and cinnamon buns) and pick up a Frodinge. If by chance they don’t have it, they also sell two other kinds of dessert. Years ago, I tried their chocolate and almond tart with a top crunchy layer and that too was excellent! They still sell it. Saturdays are “elaborate meal” days at home. That means I prepare something special for lunch. This Saturday, however, I had some deadlines to meet including a funeral service I had to go to, but we still managed to have something special and had the most delicious, daintiest Swedish princess cake with mocha coffee. 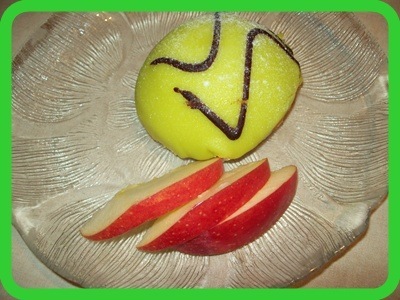 The picture below shows I sliced apples in a hurry for this blog’s “mug shot.” But when guests are coming for dinner, you can buy some raspberries and kiwis and arrange them artistically on a dessert plate – befitting a princess! They would look attractive in a bed of tiny fruits and perhaps a thin layer of brown or white chocolate syrup. These princess cakes have a sponge as the bottom layer, and a rich white cream with a sliver of jam. The whole cake is topped with green-colored marzipan and a chocolate swirl on top. A visual delight, not to mention the not-so-sweet, not-so-heavy taste. It’s a wonderful slice of Sweden!